Oh happy day! It's been a long time coming, but the ECU throttle mapping is finally where it needs to be! Well, in my lowly opinion, anyway. From the beginning, I always felt B mode was too snatchy, especially while decelerating. So, I ran the bike in STD mode for the smoothness. However, B mode was infinitely more entertaining while moving 'up' the rev range. What to do? Well, as covered a few pages ago, Flash Tune unlocked the ECU and gave access to remove the factory's throttle restrictions. This brought back the power (and then some) while Nels @ 2 Wheel Dyno Works did a great job on the fuel and timing. Still, the throttle response never quite sat right with me. And again, as discussed previously, managed to get that fixed up. But the damn decel tables still alluded us. Mostly because Flash Tune locked those portions of the maps. After much back and forth, FT unlocked our file so we could play around with some various settings. This all started before the holidays, but be it as it may, things move slowly at this time of year - mainly due to weather. But, I'm happy to report that a few more go-rounds with the decel tables netted a final product I'm happy to leave alone. Unless the rider is deliberately ham-fisted, it's near impossible to feel any wrinkles in the throttle. Just like the FZ-09, I'm baffled why Yamaha didn't do this from the factory. Will be working with a local 'blind taste tester' later in the week to get some objective feedback on this. I think this is the answer, but before we ship this file off the the good folks at 2 Wheel Dyno Works, want to get it spot on. Spring is getting close, and we'll be ready! That's what I've been waiting to hear! How about some videos?! Excellent work! Should have made a video. Ooops. Don't typically record the 'R&D' runs, lol. We just got a foot of snow here and it's 17F. The ride may have to wait a bit. Lol, makes sense. What's the top speed now? I guess I'll have to find out when I buy it this summer. Can't wait! Thanks for the update! Curious why you didn't do the cat delete and exhaust. Although I guess it could have to do with the local laws. Glad they did away with emissions testing here in AZ. Anyways thanks for the great info. Truthfully, I have moved away from removing emissions equipment on my personal machines. Plus, it's not like the power is needed. Plus this is one of those rare bikes that the stock exhaust sounds good!! Not only does the stock exhaust sound good, it actually looks good, and it is titanium to boot. It looks better than the aftermarket ones I've seen. I really can't see the purpose of throwing on a new, expensive exhaust system, but since time immemorial the first thing guys look at is removing the old pipe and throwing on a louder, more obnoxious setup. And as these things get more and more complicated with electronics and emissions control they can easily get out of whack and then they end up running worse than stock. But ya' gotta do what you gotta do. I also despise loud exhausts. So I guess that is another reason why I wouldn't decat. I agree completely. I'm having my header pipes ceramic coated black to match the bike. I may also do some high temp paint on the cat. Not sure. It's $180 for the pipes and $75 more for the cat for all ceramic. It really depends on how much more work is needed to pull the cat and ship it along with the header. I like the stock exhaust sound just fine. And, I like the looks of everything but the cat. It should look better all black. The titanium muffler is really hard to beat. Far better than a lot of replacements I've seen. I think people just feel the need to change everything from original to make it more personal, which is fine. I like most of what Yamaha came up with on the -10. The good news is a short warming trend this week. I hope to swap out my shock with my brand new Stoltec/Penske Double Clicker and do some riding. Pretty excited about that. 2. Reduce some unsprung weight to further increase ride quality. The red color was an extra bonus, but I do really like the way they pop against the blacks and grays. There's a certain degree of undeniable classy bling at play here. Despite costing a mini-fortune, these wheel sets are a great value. Right out of the box, they include bearings, wheel spacers, distance tubes, cush drive, 90 degree valve stems, and rotor mounts. 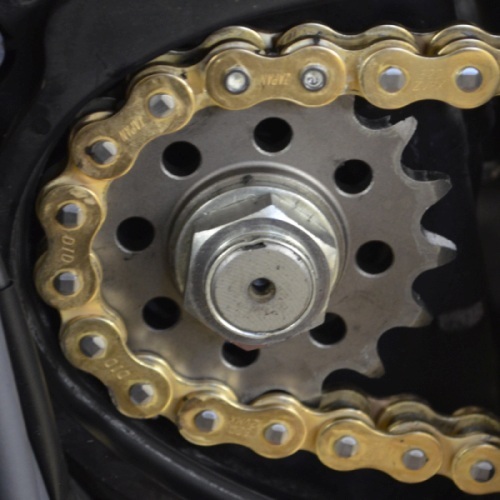 The stock rotors and ABS rings are directly compatible, but you'll need to swap to a Kawi sprocket. 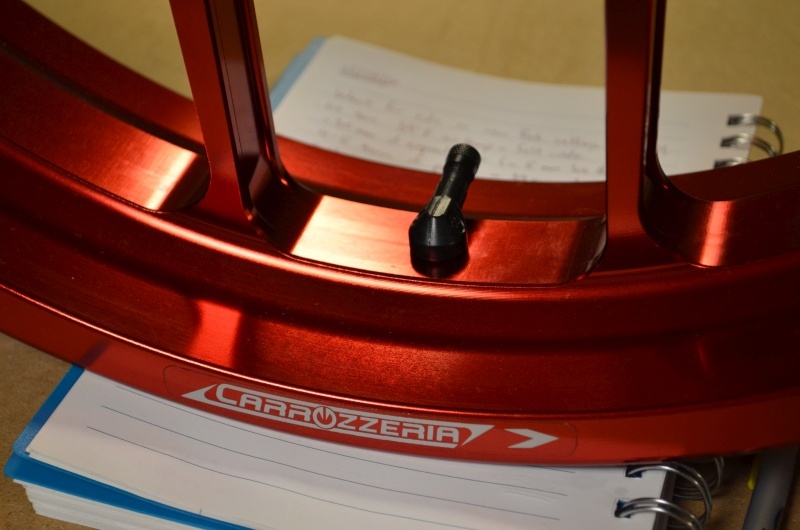 The anodize is nicely done with no visible raw aluminum (even the OE wheels have bare aluminum visible that will corrode over time). Did I mention they look really sweet? The wheels end up being 1.2 lbs lighter in the front and 1.6 lbs out back. It's a decent drop in rotating unsprung mass, but it's not as substantial a weight loss as compared with other OE wheels. This is a testament to how light the cast OE wheels really are. The 'hollow' hubs are something you didn't see too many years ago. For that matter, the FZ-09 (and -07, FJ-09) are very light. Go Yamaha! If you're building a second set of wheels, it only makes sense to do it right and buy a new set of rotors. Added a set of front and rear Galfer wave rotors. I'll be the first to admit that the stock rotors aren't an issue for street riding on this bike. We started carrying Galfer's rotors a few years back when we were experiencing issues with our FZ-09's brakes on the race track. Long story short, those rotors were 298 mm (as compared to these 320 mm) and had few buttons. As a result, we were overheating pads left and right. Didn't matter which ones we used. The Galfer wave rotors are nice because they provide a continuous wipe of the pad with a groove. Lots of airflow, and a great leading edge to deliver better bite. The extra buttons also helped channel the heat away from the rotor to the wheel. All said and done, these fixed the issues we were experiencing at the track. The front rotors save 0.2 lbs per side while the rear saves a whopping 0.6 lbs! Not bad at all! It takes some time for the pads to bed in on the new rotors, but once they do, the bite is much improved compared to the stock rotors (and again, there was nothing wrong with the stockers). Between the SS braided lines we developed with Spiegler, the R1 master cylinder, the better pads, and these rotors, braking performance is pretty damn impressive. Certainly not left for wanting on the street! Of course, we can't forget the R1M calipers. I'll be honest in that I wasn't keen on the silver calipers. I'd rather have the black R1 calipers, but these were on the shelf as take offs for the better part of a year. We use what we have. But why? Simple. The R1 and R1M calipers use aluminum pistons in place of the FZ-10's steel pistons. 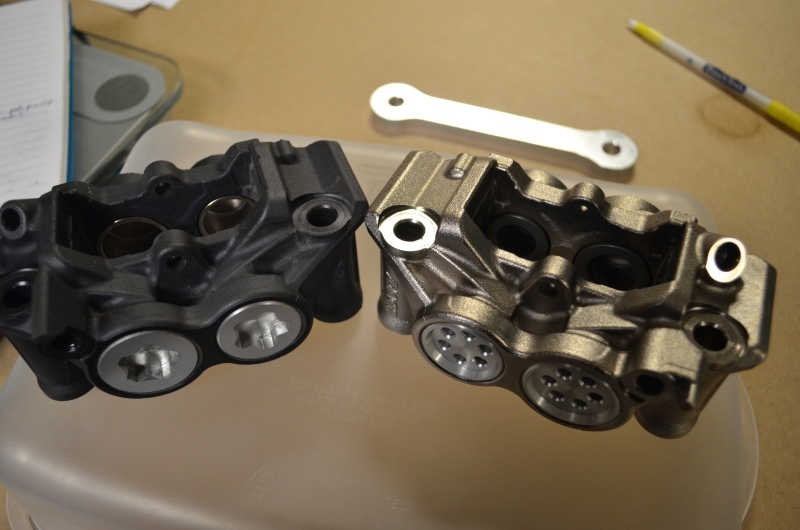 Not only are these lighter (0.3 lbs for both), but the aluminum pistons help dissipate heat from the pads to the fluid more rapidly. Not a concern we'll have on the street, but will be useful at elevated track speeds. Besides, if you can't ride like a star, you may as well look like one. Right...? Since the new wheels wouldn't accept the stock rear sprocket, it was a good time to make a few more tweaks. Did a 520 chain conversion to save some more weight and add a link to the chain. All told, the 520 conversion saved another 0.815 lbs. 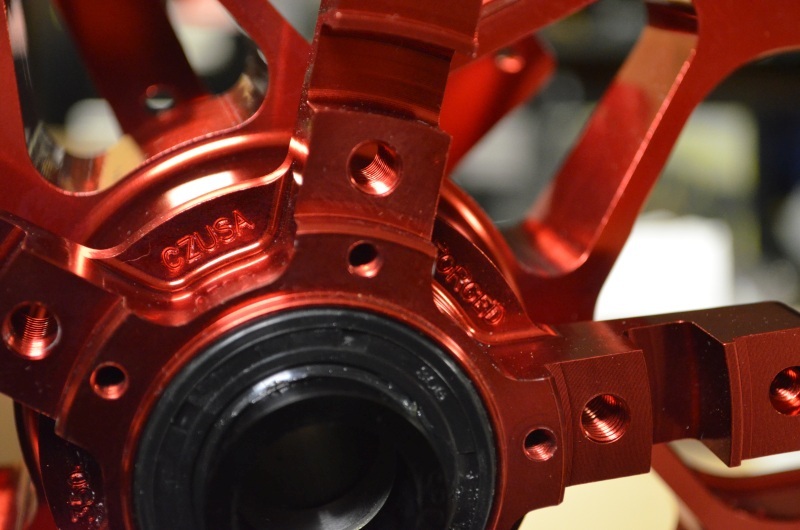 We deal exclusively with Supersprox sprockets due to their unique construction of an aluminum hub with an outer ring made of steel. Normally, these save quite a bit of weight when compared with their steel counterparts. But, the Kawi sprocket ends up being dimensionally larger than the stock -10 sprocket. As such, the new sprocket saved a measly 0.026 lbs. Let's call that practically nothing. But, ditching the stock chain guard on the sprocket freed up 0.26 lbs on it's own. The drilled front sprocket frees up another 0.097, but the chain shaves off 0.41 lbs despite being longer. Why longer you ask? Despite Yamaha's marketing pitch about how the -10 has the shortest wheelbase of all their FZ bikes, reading between the lines explains a lot. 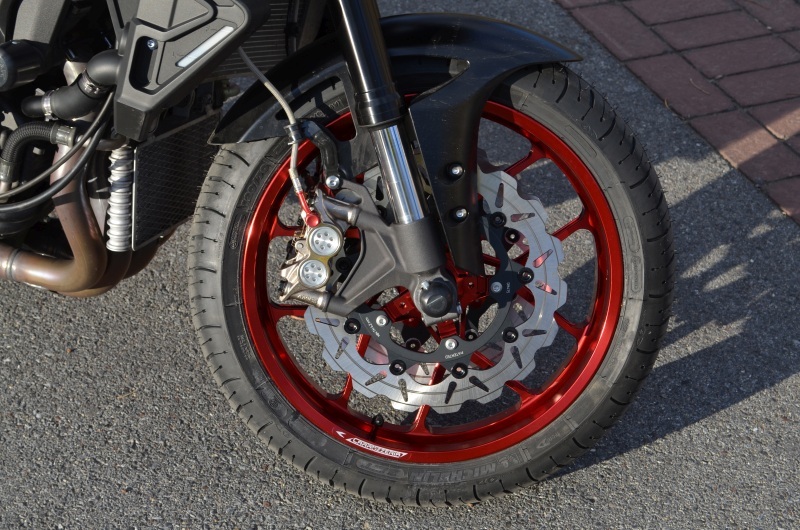 It's shorter because the -10 adds 2 teeth to the rear sprocket, but retains the R1's swingarm, front sprocket, and chain. Of course it's shorter. Doesn't make it better. In fact, it makes the bike twitchier than it needs to be and reduces rear suspension leverage (increases effective wheel rate - stiffer!). So, the stock 114 link chain was ditched for a 116 link chain. 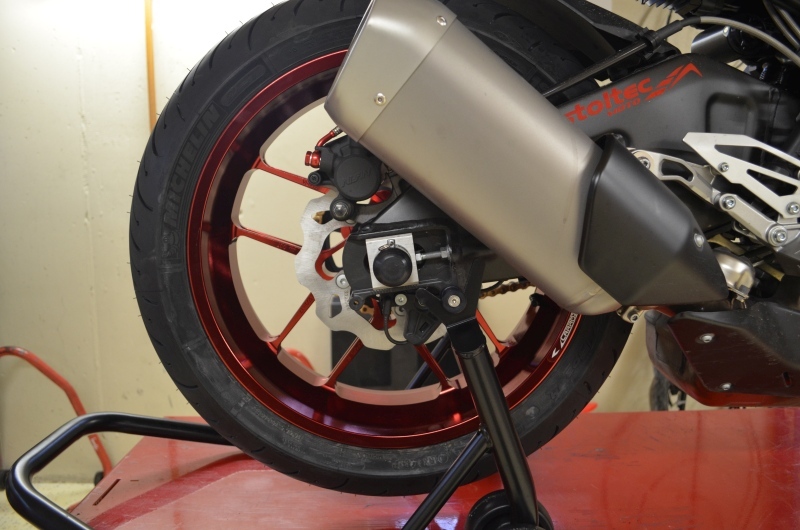 The extra length helps reduce the rear wheel rate by about 5% and increases traction out of corners. It'll still wheelie like a 2 stroke on the pipe, but it takes a bit more prodding. That's a good thing, because it means corner exits are more stable. Better drive out of corners means better tractability on the street and lower lap times on the track. A keen eye will notice that the axle is much further back in the adjustment range. Works out to about 16 mm extra length, and there's still room to take up chain slack as it wears. Going any longer would require swingarm modifications. At this point, I don't personally see the point. Handling is pretty sublime in its current configuration. A naked R1...just as it should! One month into spring here in the northern hemisphere - and isn't it lovely? Truth be told, we had another mild winter with the minor exception of one 20" snowfall back in mid March. Still, it's nice to ride without heated gear - heck, even most of the gravel has been cleaned up! This is all to say that the FZ-10 is finally back on the road after a plethora of changes which I'll do my best to work through. But first, some context to the project from here on out. The scope has changed. Significantly. 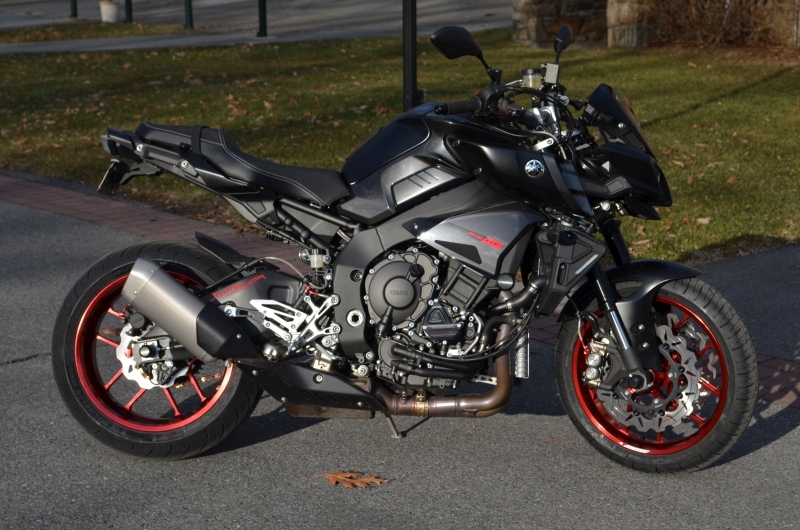 When the bike was first purchased, the idea was to replace the project FZ-09 (which was a short distance ripper). It was expected to see random street rides, some track days, and a whole lot of wrenching and playing. With the exception of the latter, the FZ-10's role has expanded significantly. After ironing out some of the kinks, it turns out the bike is an excellent daily commuter. Like REALLY excellent. So excellent, my steadfast 2003 Honda VFR800 is no longer the go-to steed. That may not sound like much, but trust me - this is high praise, indeed. I won't wax too poetic here, but suffice it to say I consider the sixth generation VFR800 to be the epitome of a do-it-all street machine that everyone wants but doesn't know it. Sure, the specs are lousy-ish (over 500 lbs, long wheelbase, 'only' 105 hp, and so on). You can accuse Honda of resting on their laurels, getting a bit lazy with V4 development, and ignoring the SPORT touring market. You'd be right. However. And this is a BIG however - ride one of these bikes and you'll find a charisma that other bikes struggle to discover after considerable investment. I know this sounds odd considering the subject is Honda - a company known for making excellent two-wheeled appliances of late. But you gotta believe me when I say the bike has some soul. Uncork the exhaust and that V4 growls. Long before Aprilia and Yamaha got fancy, this was THE mill to have. Exotic, yet practical. The early VTEC wasn't perfect, but it wasn't bad when you gave it the stick. And surprisingly, the engine does an admirable job of pulling the anchor down the road, especially over 8,000 RPM. Slow? Not. At. All. The linked brakes are a little wonky, but once you replace the 12 miles of rubber lines with SS and get used to the feel, they actually work very well. Once you get over the lack of initial bite, you'll find they are easy to modulate and somehow manage to slow the pig down. They work without issue, pure and simple. The crown jewel, though, is something that has never received much mention: the chassis. There were enough revisions over the years to make a significant difference, and it's a shame that it never got the credit it deserves. Plenty rigid to have a stonking good time on the street, but flexible in all the right places that it rode impeccably. Stability on the highway, quick reflexes on the back roads, and just the right amount of flex to keep the rider happy at all lean angles. The suspenders were nothing special, but they worked better than stuff we're still getting today. Upgrade them to quality bits and bobs, and the bike really rails. What's not to like about all day comfort with a SANE level of sporting pretenses? If you're still with me at this point, you're probably wondering why I'm bringing up a fourteen year old bike. Simple. It was an impressively awesome motorbike. But even more impressive is that the FZ-10 has dethroned the VFR in my eyes. Despite a fuel range that pisses me off on a daily basis, the bike does everything the VFR does, but better. Sure, it took some suspension work to gain the comfort and control I was looking for. Yes, the brakes were a bit lacking when you consider the sporting potential of the chassis. The stock seat sucked. It still fills the garage with a volatile air/fuel mixture to the point that you should leave a window open after a ride. Despite these (mostly) fixable quirks, the bike has me smitten. Completely and utterly smitten. It fits me like a glove. The seat to peg distance. The seat to bar distance. The width of the bars. The placement of the instrument cluster. The seat height. If I didn't know any better, I'd think the factory snuck an engineer into my house to measure me while I slept. Creepy...but I appreciate their obvious concern for my well-being. Thank you, Yamaha. Fitment aside, the engine blows me away on every ride. It's so cliche to say it's the best engine I've ever ridden, but it's true. I'm not wet behind the ears and I've owned and ridden many bikes over the years. But this engine is special. Really special. Uncorking the ECU tamed the beast, added quite a bit more snap, and has little regard for my driving record. Smooth at all cruising speeds, torque for days in all gears, and an utterly sublime exhaust note. What's not to love? All this to say the FZ-10 is here to stay for a while. It's going to take on a more multi-purpose role. It's going to get ridden, stay dirty, be loved. It's good to be back in (this) saddle again. High praise to be sure. I agree with all of it. It's the best bike I've ridden. Can't wait to see what's next. Thanks for the update.